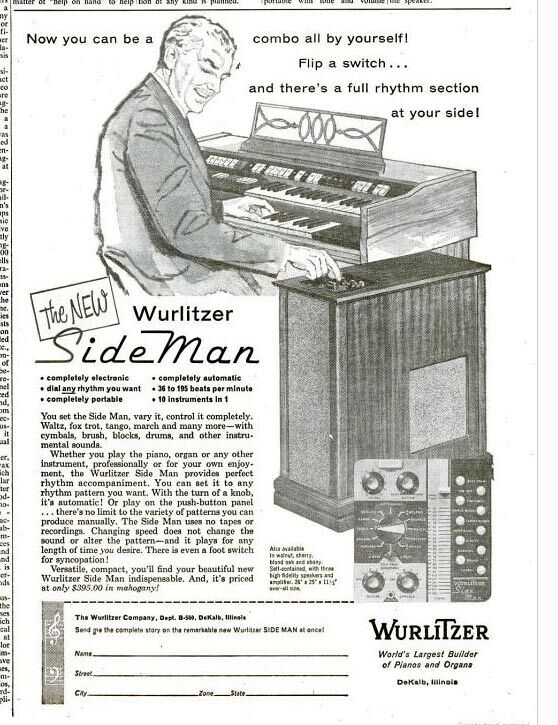 The Rudolph Wurlitzer Company released an early commercially produced drum machine called the Sideman in 1959. It was an “electro-mechanical” drum machine that offered a choice of 12 electronically generated predefined rhythm patterns with variable tempos. The sound source was a series of vacuum tubes which created 10 preset electronic drum sounds. The drum sounds were ‘sequenced’ by a rotating disc with metal contacts across its face, spaced in a certain pattern to generate parts of a particular rhythm. Combinations of these different sets of rhythms and drum sounds created popular rhythmic patterns of the day, e.g. waltzes, fox trots etc. 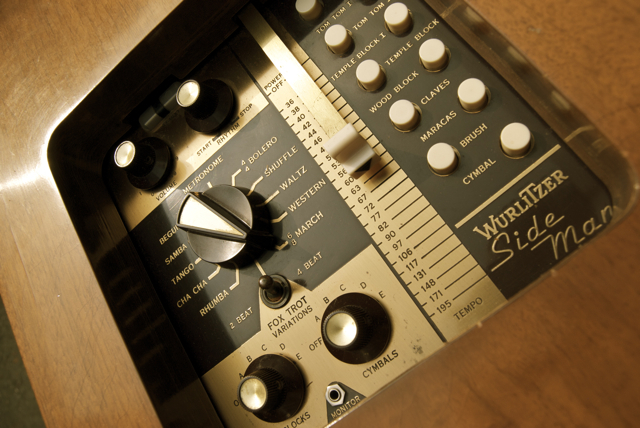 These combinations were selected by a rotary knob on the top of the Sideman box. The tempo of the patterns was controlled by a slider that increased the speed of rotation of the disc. The Sideman had a panel of 10 buttons for manually triggering drum sounds, and a remote player to control the machine while playing from an organ keyboard. 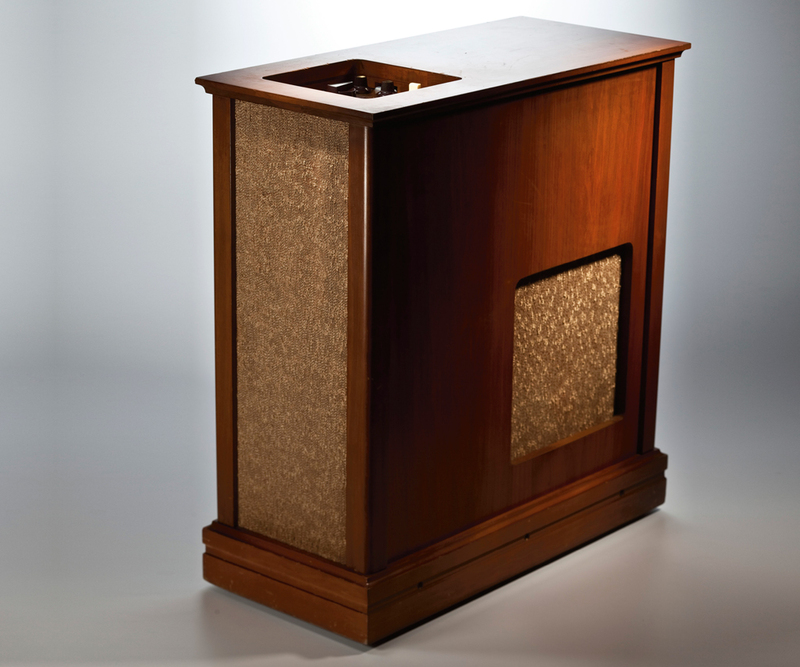 The Sideman was housed in a portable wooden cabinet that contained the sound generating circuitry, amplifier and speaker. Hmm.very informative. Thanks for posting this! What an incredible history site. THANK YOU SO MUCH. What about the VOX and Farfisa electronic organs, of the 1960s+? They played a big part of pop & rock music—because of the portability, relative to a Hammond. There were also electronic “pianos.” And was it the Clavinet that was a combo mech & electronic? Again, very popular, awhile. Rock keyboardists began carrying multiple instruments, until the 1980s when digital samplers picked up all the famous & popular instrument sounds. I’m actually looking to purchase one of these – are you interested in selling? I have one for sale on Detroit”s craigslist now. in the upcoming issue of Berlin based magazine for contemporary art „Texte zur Kunst“, the Wurlitzer Sideman is mentioned in a text about sound by Rolf Großmann. Therefore I wanted to ask if you can provide us with the images of the Sideman on your page in high resolution (300 dpi, 12 cm width) that we can show with the text? Please also provide us with the caption Information and credit /courtesy line. If you don’t have the permission to send us the photos, please tell me where you got them from so I can contact that person! If you have any questions please don’t hesitate to contact me. Many thanks in advance.